It was back in December 2011 that I first interviewed exciting young chef, Shaun Dickens, for my Top Ten Cookery Books series. Shaun had arrived at Fallowfields, a country house hotel in Oxfordshire, a few months before with ambitions to turn round the restaurant – and he did, earning it 2 AA rosettes pretty quickly. With an impressive history of working in top Michelin starred restaurants – training with Raymond Blanc for 3 years at Le Manoir aux Quat’Saisons (2 stars), followed by 2 years at Per Se (3 stars) in New York with Thomas Keller, and then working as sous chef for Alan Murchison at L’Ortolan (1 star) – Shaun was obviously a chef going places. 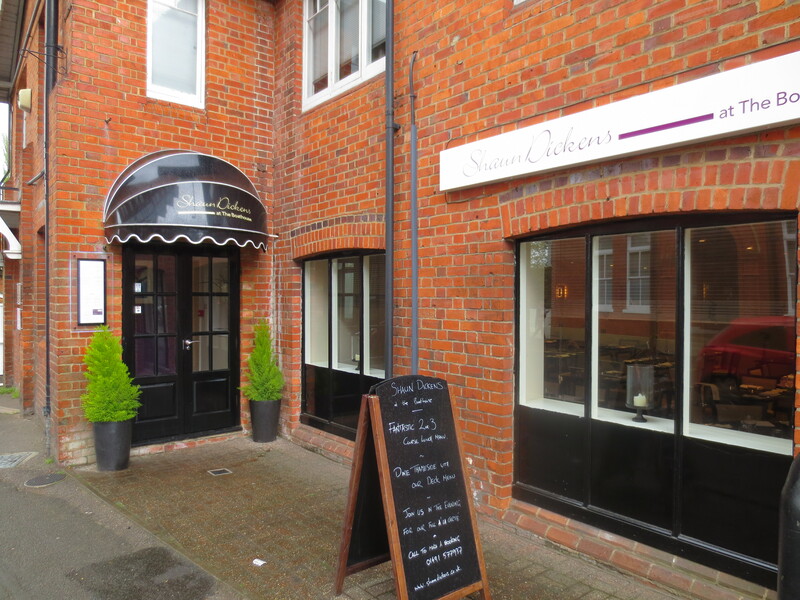 I finished my last interview post saying, ‘(Shaun) just has to be a chef to watch out for.’ Thus, I wasn’t surprised to hear that Shaun had moved on and opened his own restaurant in Henley-on-Thames: Shaun Dickens at The Boathouse. I thought it would be great to go to see the new restaurant and hear about Shaun’s plans. And also I couldn’t possibly go without eating – having sampled Shaun’s cooking before! – so I asked my friend Nina, who lives quite close, to meet there after the interview to have lunch. Despite the rain, it was still possible to admire the wonderful setting of the restaurant, right on the river near the bridge crossing the Thames at Henley. 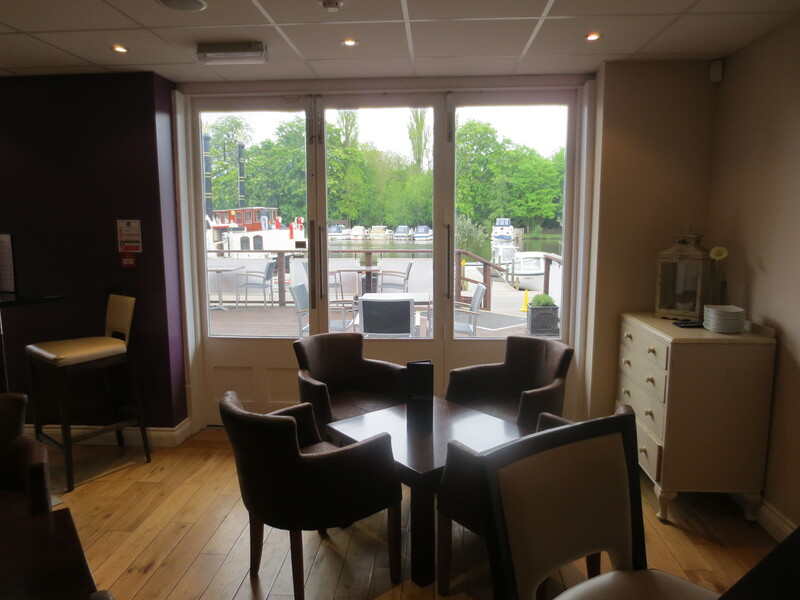 Comfortable chairs in the bar area show onto a great view of the river and deck area. Sean told me later that there’s a deck menu for snacks but no one can reserve a table for lunch; they’re given on a first-come basis. Eventually, it will an area to sit with drinks and canapes in the summer before you eat and where you can go after your meal to enjoy coffee and petit fours. 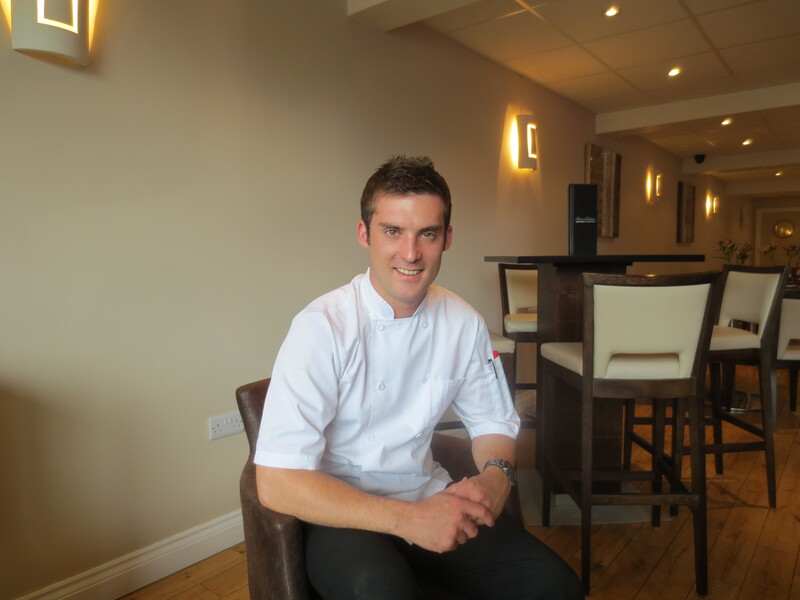 Sean, at the age of 29, is a chef who has achieved a lot but his ambition still shines through as he talks of the future. 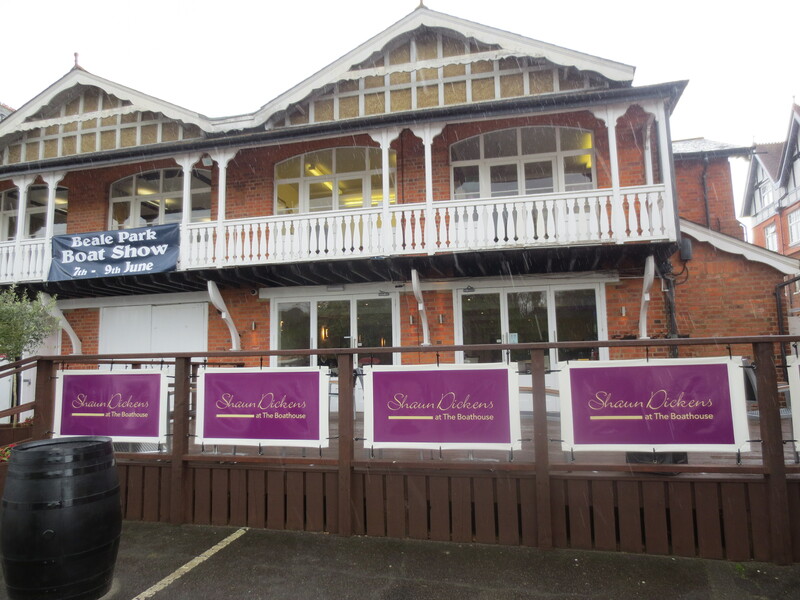 The Boathouse is an exciting step but Shaun isn’t a guy about to sit still on his laurels. He talked to me of his goals, dreams and vision. The opening of The Boathouse has of course been the dream but, he tells me, he’s always striving for perfection. He’s always looking to improve things. This is reflected in his menu. He hasn’t worked out a ‘nice’ menu that he’s sticking to; the menu changes all the time. Not so much ‘with the seasons’ but very much according to what’s available. A whole page of the restaurant’s website is devoted to ‘Partners’ – the suppliers; the people he buys all his produce from. Shaun is committed to using the very finest ingredients and he will respond to what’s available week by week; even day by day. He told me, if a supplier rings and says, I’ve got some wonderful Sicilian lemons, or, I’ve got some fantastic new asparagus, some samphire or wild garlic, Shaun will take whatever is good and then decide on the best way to prepare it. He talks of a driving passion for his dishes and developing new ones. Having heard him talk about the great places he’s trained and worked at before, I can see as Shaun talks that he wants to pass this experience on to the people working for him, encouraging them to be creative too. His head is already full of plans for the next three years; where he wants to take The Boathouse. But first, he told me, he needs to understand Henley and wait for Henley to understand him and his primary goal is to attract locals. However, he also strives to make The Boathouse a foodie destination; eating here will be not just be about eating great food but the whole experience. Hence the plans for the deck so that an evening or lunchtime at The Boathouse, especially in good weather, will be a total eating experience. He wants to offer excellent service that isn’t obtrusive but totally professional; to bring youth and vibrancy to the restaurant through the ambience and the way you are greeted and looked after. The restaurant only opened a month ago – on 11 April – but already he’s attracting regulars; people who want to come back – and do. Raymond Blanc came to the opening and is full of praise for Shaun in a post on his own blog, saying that he’s sure Shaun ‘will make his mark at this restaurant’. It’s certainly already made a mark on me with the great lunch I had once Shaun and I had finished talking. When Nina arrived we sat by the window for a drink and to choose our food from the lunch menu (£17.95 for 2 courses; £21.95 for 3). 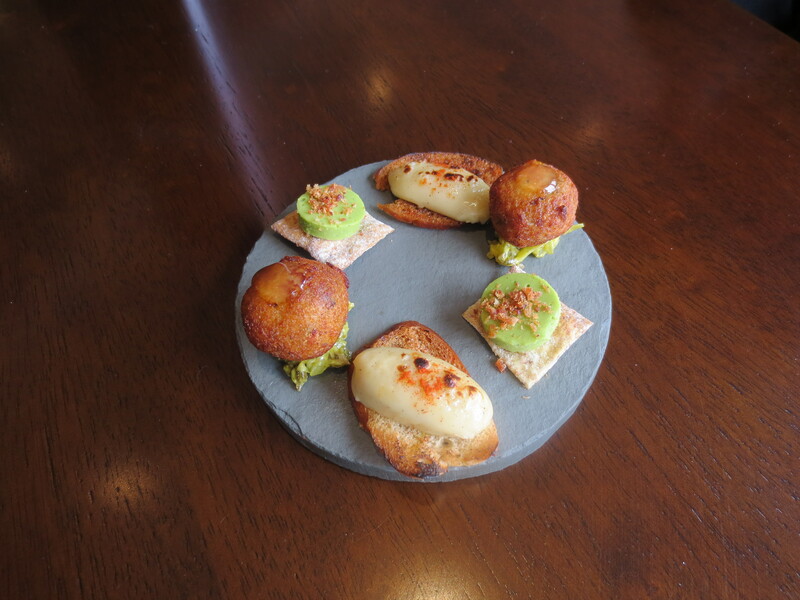 A plate of wonderful canapes came with our drinks. They were divine; one an asparagus panacotta that was rich with the taste of asparagus. When our food was ready, we were shown to our table. We’d both chosen exactly the same food. Nina kindly offered to choose something different as I was going to photograph for the blog – though I think if that was important it was up to me to be different! – but I said we should both have what we most wanted. 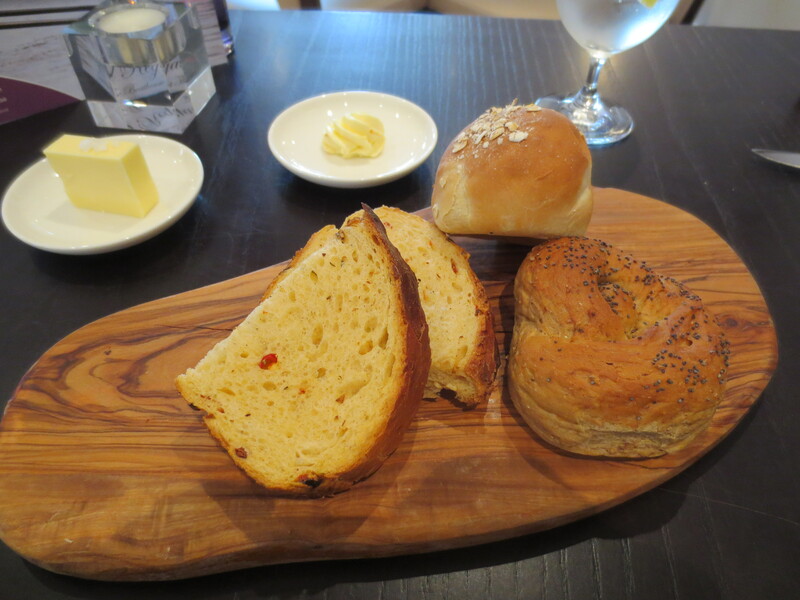 Bread was brought – three kinds with two kinds of butter. I had the tomato bread which was light and really delicious. We also each had a small (125ml) glass of wine from a good choice of wines by the glass. 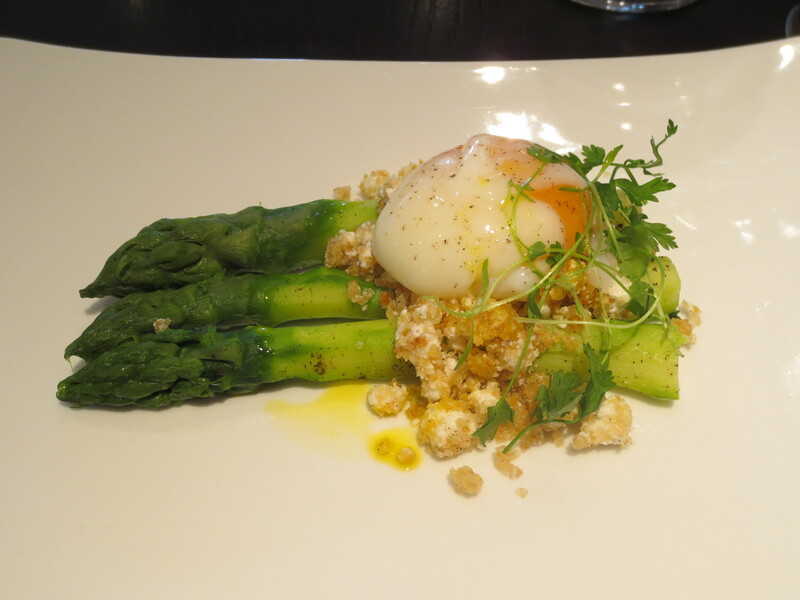 Our starter was some fresh asparagus with poached egg and some wonderful goats’ curd cheese (which Shaun had told me about sourcing nearby) with potato crumbs. It was wonderful. Every part cooked to perfection and the combination of flavours working brilliantly together. 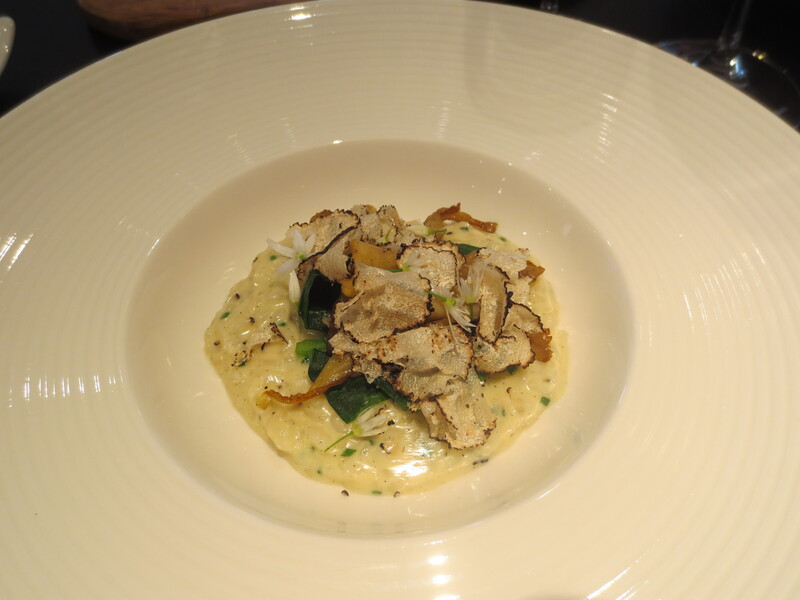 Then came a surprise – a pre-main course dish of truffle and garlic risotto, with mushrooms and a little spinach. This looked wonderful and it tasted wonderful. It was sublime: rich and creamy and a perfectly cooked risotto. It felt like a special treat as we hadn’t known it was coming! There’d been a choice of three dishes for each course. 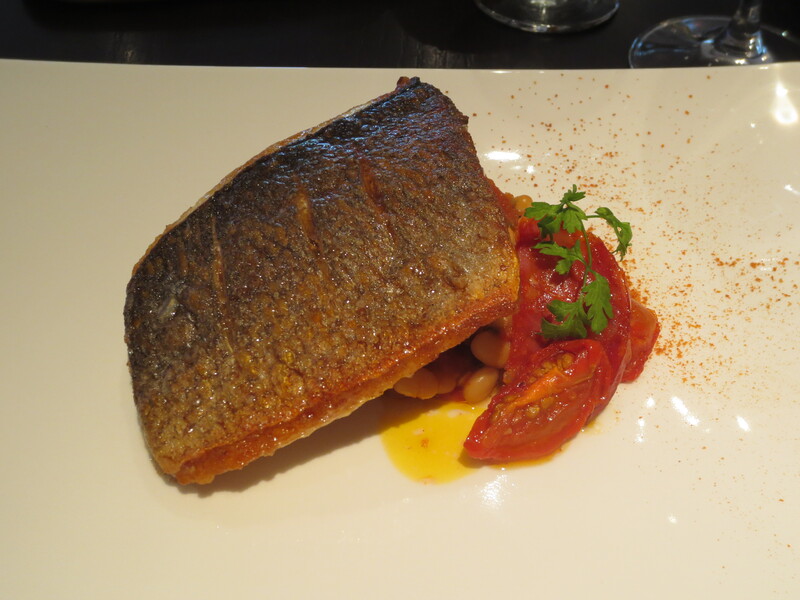 The mains were a vegetarian pasta, beef cooked in red wine and – our choice – seam bream with beans, tomatoes and chorizo. I love sea bream (as you’ll know from a post the other day), and this warm, spicy accompaniment worked very well. We were, you won’t be surprised to hear, far too full by now for dessert so we just ordered coffee. But there was almost a turnabout when Nina pointed out wonderful looking desserts arriving at a nearby table. I must have dessert another time! 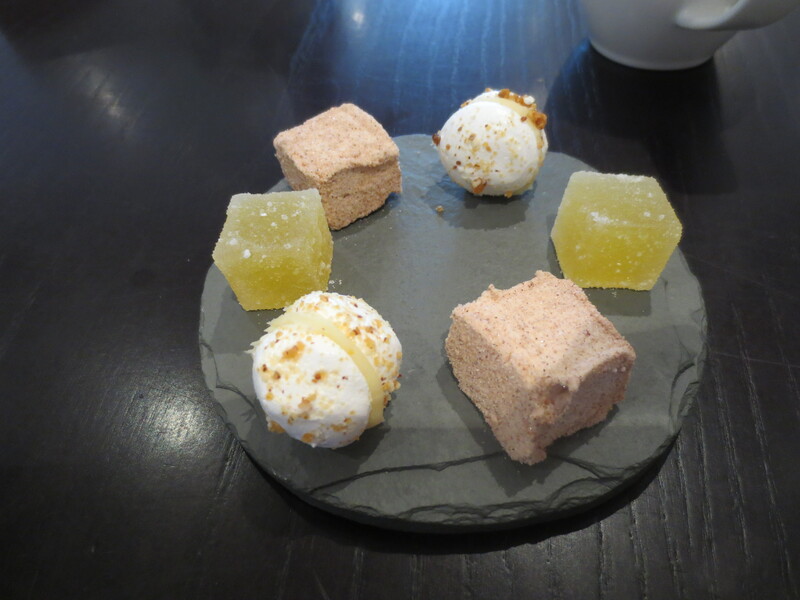 But we weren’t entirely without a little sweet treat and a plate of lovely petit fours came with our coffee. It was a really lovely meal and I can see The Boathouse would be a great place to head to for an outing – even if, like me, it’s a bit of a drive away – especially in the summer when one can enjoy the riverside setting. 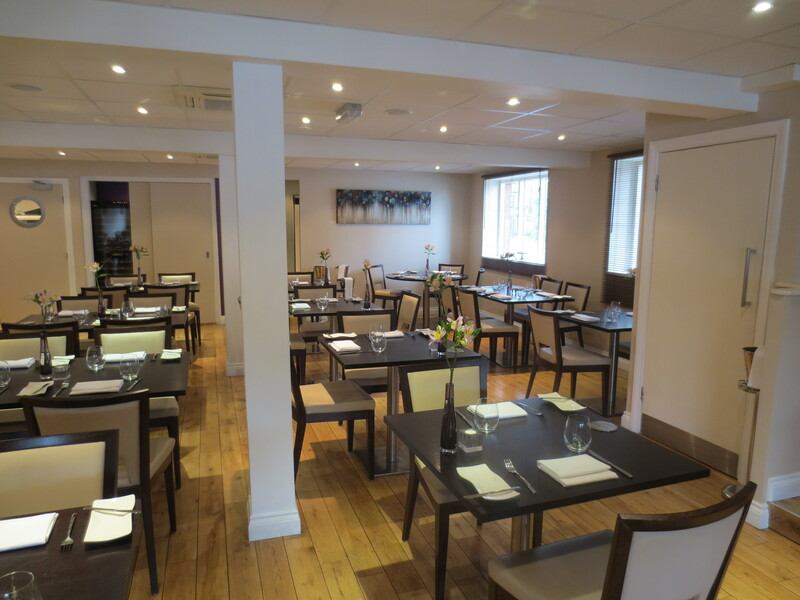 I’m sure they can do lunch quickly if you need it, but really this is a place to come and take your time to relax and enjoy some excellent fine dining in a great setting with very good and friendly service. Thank you, Karen. It was lovely. When you come to London again you must take a trip out to Henley. Pretty part of world.